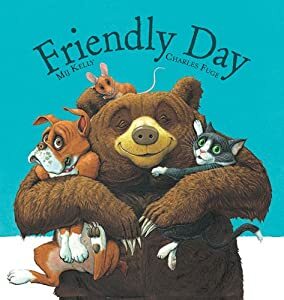 In Friendly Day children will laugh out loud at this amusing story of a clever mouse who tricks a hungry cat into sparing his life by telling the cat that it's Friendly Dayâ€¦the one day in the year when all animals must share, care, and be nice to one another. Bright illustrations and sparkling rhyme follow suit as the cat imagines all the world's animals getting along--from a rhino who knits kitten mittens to a shark having a friendly game of chess with a school of fish. Mij's first children's book won the Kathleen Fidler award in 1993 and she's been writing ever since. She used to test out her stories on her children, now she tests them on her granddaughter. Charles' picture book debut won both the Macmillan Prize and the Mother Goose Award. Since then he has illustrated more than thirty picture books, including the best selling Little Wombat stories. This was a cute story and one that if all animals felt this way, what a world we would have. Set aside the animals and put in humans in their place and what a world we would have too! The sentiments in this book are simply wonderful and you have to love the illustrations that go along with the book itself. The book shares some great ideas and I loved that at the end the animals are starting a new path for themselves! Overall, this is a great story with a great message that the whole family will love!